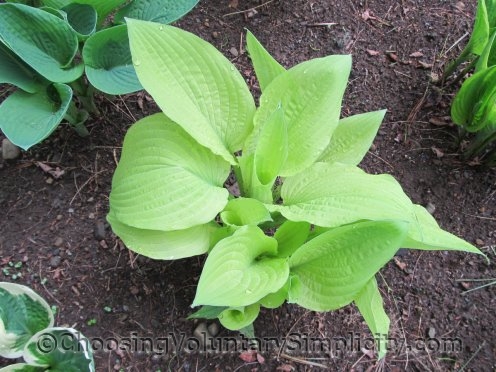 Home » Growing Hostas » Can They Still Be Considered Seedlings at This Size and Age? I’m seeing some interesting changes in some of my hosta seedlings this year. Most of the seedlings in this group are four to five years old… a few are probably a year or two older. 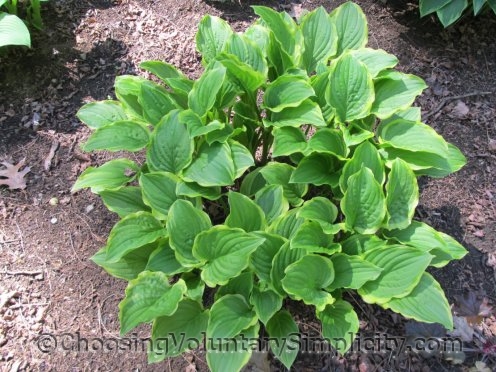 My favorite hostas are always the soft blues and yellows or hostas that have ruffled or deeply corrugated leaves… and for years now I have collected and planted a few seeds each year from hostas that have these characteristics. I wonder, though… should I still be calling these plants seedlings? 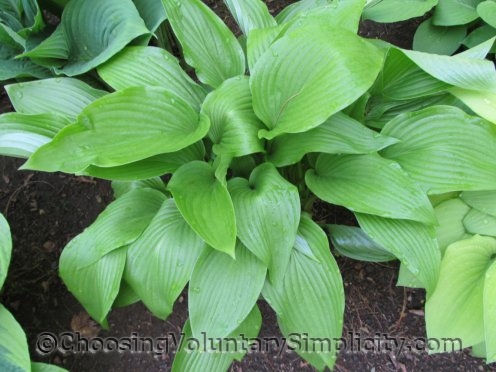 To me they ARE seedlings because I started these hostas from my collected seeds, and calling them seedlings help me to differentiate them from the more mature plants… but can they still be considered seedlings at this size and age? This seedling is one of my very favorites. It is a softer yellow and has fewer green tones than this photograph shows. Its leaves are just starting to have a very pebbly texture and distinct ruffled edges. This is one of the older seedlings despite its smaller size. This is another seedling that I really like. 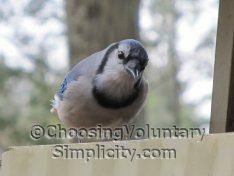 The color is very light and more blue than green. At this point some of the leaves are almost round… others are heart-shaped and pointed… I’m hoping the roundness and pebbliness will prevail. This year the leaves are edged with a thin border of blue. This is one of the slower growing ones. Its leaves aren’t fully unfurled yet but I can see that this year they are even rounder and more heavily pebbled than they were last year. The color is a very bright lime (?) green. This one was a real surprise because last year only a few of the leaves had the yellow border… this year there is a border on almost every leaf. And… the leaves are so ruffled I think they could be classified as pie crust! 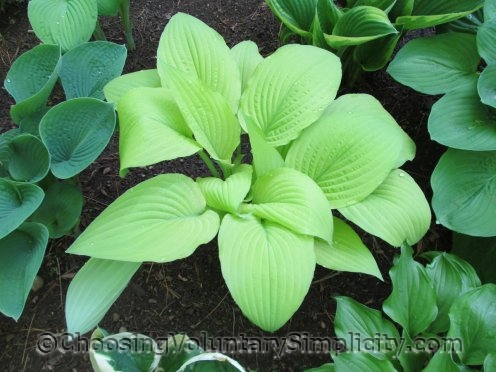 This is a small but not miniature hosta. It is one of the younger seedlings and has grown very fast. This one is an even paler yellow and it too appears to be developing a nice ruffled edge. Most of the leaves are shaped like an elongated heart and it looks like eventually they will be quite pebbly. This one’s claim to specialness is its extremely thick leaves. They actually feel like a piece of heavy smooth plastic. The top side of each leaf is shiny but the underside is a matte pale blue. I can see just the suggestion of a ruffled edge. What do you think? Can they still be considered seedlings? Here’s my 2cents (fwiw). I think ‘seedling’ can be used if the plant was raised from a seed no matter how old it gets. 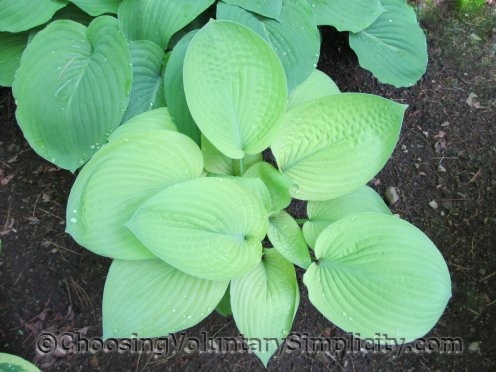 As in ‘such and such hosta seedling’. I think these could be hostas and seedlings. They are beautiful btw. I looked it up. The dictionary says seedling is a plant originating from a seed as opposed to division or other propagation methods I suppose. So I think these still are seedlings. But they are lovely hostas whatever you call them. I am full of envy for your plants and gardens. I can’t even imagine how many hours you spend working with your plants to have them look the way they do. My grandmother is 94 and she still calls her 70-something sons and daughters the boys and girls. 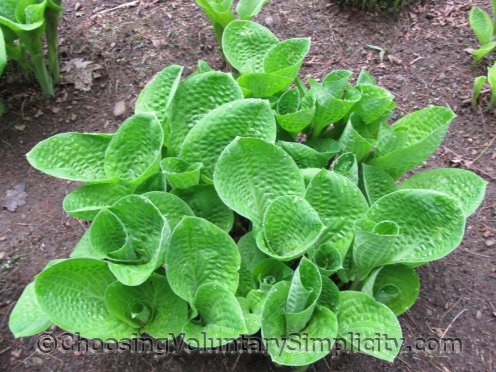 So if you want to call these hostas seedlings – go ahead! They’re seedlings.